I continue to receive a lot of questions about Wisconsin’s 8 seed (read the blog post here). The NCAA men’s basketball selection committee doesn’t just assign seeds to teams, it also puts the teams into the bracket, which involves assigning a team a seed, assigning other teams to the regions, and assigning locations to each game. This is an NP-hard problem that involves balancing several interdependent decisions. You can formulate the problem as an integer programming model subject to many assignment and distance constraints. Cole Smith, Barbara Fraticelli and Chase Rainwater published a paper on optimization models to design good tournaments that balances these constraints while getting the seeds right. As far as I know, the committee constructs the bracket by hand. Below are the official rules for the final part of constructing the tournament called “Building the Bracket.” The emphasis is mine–I boldfaced the major rules that constrain how the bracket is built. There are a lot of rules, so many that even identifying a feasible solution may be difficult. Near the end: “A team may be moved up or down one (or in extraordinary circumstances) two lines from its true seed line when it is placed in the bracket if necessary to meet the principles.” I suspect Wisconsin was given an 8 seed to conform to all the rules. It’s worth pointing out that Wisconsin’s low seed was ultimately unfair to top seed Villanova, who had an extremely second round opponent (sorry not sorry, ‘Nova). Optimization models and algorithms could have constructed a bracket that was more fair to the teams. 1. The committee will place the four No. 1 seeds in each of the four regions, thus determining the Final Four semifinals pairings (overall 1 vs. 4; 2 vs. 3). You can read the official rules for selection and seeding for the men’s tournament is here. I did not find nearly so many rules or information about selecting and seeding the women’s tournament. Yesterday, I was on Madison’s CBS affiliate WISC-TV to talk about March Madness and filling out a bracket. I was also on NBC15 in Madison to talk about the probability of filling out a perfect bracket. Out of more than 11.57 million brackets entered in ESPN’s Tournament Challenge, one bracket emerged from the round of 64 of the NCAA tournament with a perfect 32-0 record. This is the first time there was a perfect first round in ESPN’s Tournament Challenge since at least 2010 (we’re still trying to find out exactly the last time it happened, but it’s been a number of years). A little research uncovers 1 perfect bracket after the first 32 games in 54.85 million brackets at ESPN. Last year, 25,704 of 13 million brackets (0.2%) remained perfect after the first 16 games and none were perfect after the first 32 games. None of those correctly picked the next 16 games. 182,709 of 11.57 million brackets correctly picked all Final Four teams in 2015. This year stands out because the Final four was composed of #1 Wisconsin, #1 Kentucky, #1 Duke and #7 Michigan State. Of course, these brackets missed several games along the way so none are perfect, but from these data points we can see that it’s inherently more difficult to pick a correct bracket when there are more upsets in any give year or unlikely teams in the Final Four. This year I have fielded a lot of questions about Wisconsin’s seed. As the second place finisher in the B1G and runner up in the B1G conference championship, it’s hard to accept an 8 seed. It’s even harder given that lower ranked teams are seeded higher. Maryland finished 3rd in the B1G and received a 6 seed, Minnesota was 4th in the B1G and received a 5 seed, Northwestern finished 6th in the B1G and received an 8 seed, and Michigan received a 7 seed after winning the conference tournament. Wisconsin and Northwestern really don’t deserve the same seeds. I can’t mathematically prove that Wisconsin was robbed, but I’ll try to step through the process to shed light on what happened. First, I’ll say a few things about how seeding works. The first step is selecting the field, and this is started well in advance of Selection Sunday. There are a number of teams who automatically make the tournament, and the committee first chooses who received at large bids. It’s safe to assume that Wisconsin was a lock to make the tournament all along. The selection committee looks at several ratings/rankings including LRMC (Wisconsin is 22), the Pomeroy ratings (Wisconsin is 23), the Sagarin ratings (Wisconsin is 17), ESPN’s BPI (Wisconsin is 21). Wisconsin is in the top 23 in all of these aside from RPI (where Wisconsin is 36), but RPI isn’t a very good tool and is not used to seed the teams. The committee then ranks the teams 1st to 68th (the “S curve”) to get a larger sense of what the seeds should be and to identify if the seeds in each region are balanced when the seeding is done. Teams that are consistently ranked in the top 25 are often seeded 6th or so, which is significantly higher than the 8 seed Wisconsin was assigned. There is not a lot of competition for the 1 seeds because so few teams can make a claim for the one seed. The ends of the distribution are easy but the middle is tougher because there is less difference between the 20th ranked team and the 40th ranked team than between the top ranked team and the 10th ranked team. Therefore, a team in the middle could reasonably be assigned to either a 5 seed or an 8 seed or anywhere in between. Assigning seeds is not as simple as knowing that there are four of each seed and picking one for each team. There is a lot more to it than that. Scheduling the tournament is hard because there are a lot of constraints. Teams from the same conference cannot meet in the round of 64 or 32. Therefore, a team’s seed might need to be slightly malleable to make it all work while obeying these constraints. Additionally, as mentioned earlier, the seeds need to be assigned so that the strength of each of the regions is roughly balanced. For example, the same region should not contain the best best 1 seed, the best 2 seed, and the best 3 seed. There is more. Distance is taken into account when assigning the seeds. The committee assigns game locations at the same time it assigns seeds. That makes for a lot of interconnected decisions. All seeds are assigned to one of 8 locations called “pods” where the tournament games are played. For example, the 1, 8, 9, and 16 seeds must play in the same location. The goal is to minimize travel for most of the teams, especially the highest seeded teams who often basically get “home” games where their fans do not have long to travel. There are eight pods, and two of the 4-team groupings are assigned to each pod. It’s possible to assign a team a lower seed so that they would have substantially less travel. That was not the case for Wisconsin, who was assigned an 8 seed in Buffalo.Initially, I suspected that Wisconsin was assigned an 8 seed in the Milwaukee pod, which would have been essentially a home game. That was not the case. Instead, the Badgers are getting the worst of both worlds: a bad seed and a long distance to travel. I’m puzzled by this. You cannot change one team’s seed or a pod location without creating ripple effects that affect many other teams so these decisions are not easy to make. You can see the bracket with pod locations here. I’m sure that every year a team or two gets under/over-seeded because of these constraints. It’s easy to point out teams that are badly seeded but it’s much harder to know how to fix the problems. The tournament scheduling part is so difficult that some (like Cole Smith, Barbara Fraticelli and Chase Rainwater!) have published research papers on optimization models to design good tournaments that balances these constraints while getting the seeds right. Despite this challenge, it seems that swapping Wisconsin with another B1G team such as Minnesota would be feasible, not cause other ripple effects, and would better reflect the teams’ rankings. Scheduling might be hard, but a lot is on the line so the committee should get it right most of the time. I also may be biased, but in sum, I cannot find a part of the seeding process where Wisconsin being assigned an 8 seed makes sense. I’m disappointed. Getting the seeds right matters because, in this case, an 8 seed for Wisconsin means playing overall top seeded Villanova in the round of 32, assuming that Villanova is not the first 1 seed to be upset in the round of 64. That makes for a rough path to the Final Four. In any case, this is all part of the game. 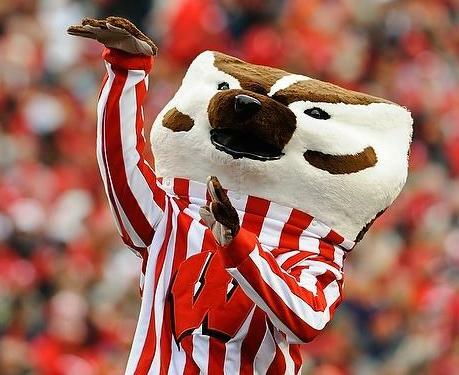 I’m looking forward to the tournament and rooting for the Badgers. I talked to WKOW in Madison about the seed. You can read about it and watch the video here. I will be talking about bracketology, March Madness, and the College Football Playoff on Tuesday, March 14 at 7:30 pm in the H.F. Deluca Forum in the Discovery Building on the University of Wisconsin-Madison camps. More information can be found here. I hope to see you there! Today I have four tips for winning your March Madness bracket pool. 1 Ignore RPI, use math based rankings instead to take strength of schedule into account. Ken Massey has a rankings clearinghouse here: http://www.masseyratings.com/cb/compare.htm. I’m happy to say that I’m the only women contributor to this list 🙂 My rankings are here. The seeds matter because they determine a team’s path to the Final Four. Some seeds generate more upsets than others, such as 7-10 seeds and 5-12 seeds. Historically, 6-11 seeds go the longest before facing a 1 or 2 seed. Teams with an 8 seed face a tough Round-of-64 opponent and have to face a 1 seed next (sorry Badgers). However, there are plenty of upsets. The Final Four has been composed of all 1 seeds only once. See BracketOdds at Illinois for more information on how the seeds have fared. Having said that, the committee doesn’t always get it right. There are Some teams like SMU, Wichita State, and Xavier are underseeded and are poised to upset. Also, Villanova is the overall #1 seed and has a 15% chance of winning the entire tournament, which is low, meaning that there isn’t a strong favorite this year. Be strategic. The point is NOT to maximize your points, it’s to get more points than your opponents. I’ve been getting in the habit of picking my Final Four first and filling in the rest later. You can pick the eventual winner (say, Villanova) and still lose your pool if everyone else picks Villanova. FiveThirtyEight estimates that Villanova has a 15% chance of winning the tournament, meaning that another team is probably going to win. One way to be strategic is to pick an undervalued top team to win the tournament. For example, last year Kansas was selected as the overall winner in 27% of brackets on ESPN and in 62% of Final Fours) despite having an overall 19% chance of winning (538). On the other hand, UNC was selected as the overall winner in 8% of brackets (with a 15% win probability). Getting UNC right last year helped vault past those who picked Kansas. Small pools are better if you have a good process. The more people in a pool, the higher chance that someone will accidentally make a good bracket with a bad process. It’s like stormtroopers shooting at a target. They’re terrible, but if they take enough shots they’ll hit the target once. why is it so easy to forecast the Presidential election but so hard to forecast the NCAA tournament? will someone create a perfect bracket this year? I didn’t say what I meant by an “upset.” Defining an upset is a maybe a super-professorial thing to do, but I can’t help myself. An upset is usually defined as the lower seeded team winning. However, some teams are seeded too low and others are too high as as a result some upsets are not as surprising as the seeds suggest. I like to take a look at the rankings of the two teams and the win probabilities to get a better sense of a game being hard to predict. For example, according to the FiveThirtyEight win probabilities, Arizona (6)/Wichita State (11) game features has a 50% win probability for each team despite a big seed differential. Other games may not be so evenly matched but produce win probabilities between 25%-75%, which means that we would expect at least 1 of 4 of these games to produce upsets, on average. I am not so surprised when this happens. I am more surprised when the win probabilities are less than 10%. There are definitely upsets in the tournament but often they are not rare events. For more, read Nate Silver’s thoughts on upsets here. Regarding the perfect bracket. While I think someone will get the perfect bracket, I don’t think it will happen this year. Or next year. Or in the next decade. Maybe we will see one within the next 100 years. There are different estimates on the probability of getting all the picks right, many are in the range of 1-in-100 billion. So many people fill out brackets–there were 11.5 million brackets on ESPN alone in 2015. With so many attempts to hit the target, I think one will strike…eventually. When it happens, it will happen on one of those years when there are not too many upsets. In 2014 with Final Four seeds 1,2, 7, 8 there were only 612 brackets on ESPN with all Final Four teams picked correctly. But in 2015 with Final Four seeds 1, 1, 1, 7 (the 7 seed was tournament darline MSU), there were 182,709 brackets with all Final Four teams picked correctly. Some years are easier to forecast than others. Given all the brackets in the online pools out there, I think we will eventually see a perfect bracket even if it does not win the official prize. More here. To win your pool, you don’t need a strategy that maximizes your points, you need a strategy that gives you more points than your opponents. Those two strategies are very similar but slightly different. To Here are Ken Massey’s composite rankings I mentioned in the interview for figuring out who the best teams are. And of course, here are my rankings at Badger Bracketology. Check our ESPN’s Who Picked Whom to see which teams may be overvalued and undervalued. It’s time for me to stop over-analyzing my bracket advice and fill out my bracket. Good luck!